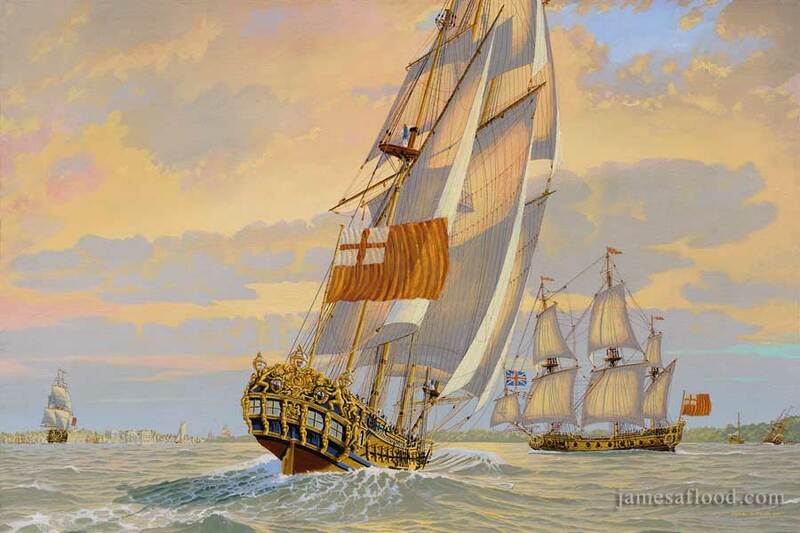 During the late seventeenth century, ships navigating the Thames River depended on wind and tide, anchoring when the tide was adverse, alternatively weighing anchor and tacking with the tide at every opportunity. In this painting the two ships, HMS Richmond and HMS Dartmouth, are depicted on dramatically opposite tacks as they approach the town of Greenwich. On the port side of the HMS Richmond a three-deck 100-gun first rate beats the odds by taking advantage of a following wind to navigate downstream. At the bend in the river one of the King's Palaces can be seen occupying the future site of the present day Maritime Museum. On the opposite shore is the Isle of Dogs; primarily pastureland at the time, it would be channeled and dredged by the turn of the nineteenth century, becoming the east end docks to an encroaching London. In this painting a ship is heeled over for servicing at one of the earlier docks on the Isle of Dogs. Workers are scraping barnacles and other growth off of her keel. King Charles II was a great lover of ships, and felt strongly towards strengthening the British Navy. Using great political prowess, Charles managed to secure funding for what was known as 'The Thirty Ships'. He was determined that these ships be of excellent design and beauty and offered up his own money to cover cost overruns. Many of these warships had a serviceable life that continued well into the eighteenth century.